BFFs Monica and Pheebs, together again… sort of. 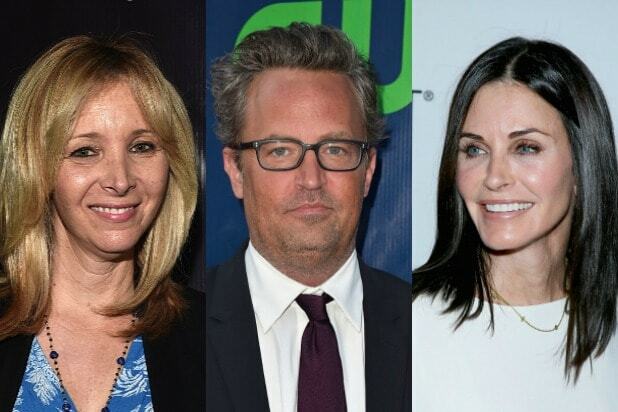 “Friends” forever, Courteney Cox and Lisa Kudrow reunited on the Craig Ferguson-hosted game show “Celebrity Name Game,” all in the name of helping contestants win big bucks. Cox, whose company Coquette Productions developed and co-produces the show, stepped forward to quiz her long-time friend. And it was a piece o’ cake for Kudrow, who didn’t hesitate once when responding to Cox’s clues. Smelly Cat, Gunther, Ugly Naked Guy — or as Kudrow called him “Naked Ugly Guy” — and Cox’s hilarious Ross impression are all worth a look. Probably the most successful of the TV offerings from an ex-"Friend," LeBlanc played a clueless Hollywood actor in this show-biz satire that ran for four seasons on Showtime. This one was a sleeper. Critics at first hated the concept and title, which seemed to promise Cox as an older woman on the prowl. But it slowly grew into a sly comedy (first on ABC then TBS) about middle-aged suburbanites who drink and gossip far too much. 3. Matthew Perry/"Studio 60 on the Sunset Strip"
The critics generally liked it, as they do much of the output of writer-producer Aaron Sorkin. But this satire of a "Saturday Night Live"-style variety show might have been a bit too insider-y for network TV, prompting its quick demise. NBC gave it a single season in 2006-07. 4. Matthew Perry/"The Odd Couple"
It helps to base a sitcom on a classic Neil Simon play, which then became a movie and a long-running 1970s TV comedy. On CBS' version, Perry returns as Oscar Madison, the lovable slob who moves in with a fussy fellow bachelor. Like "Episodes," this show was a "meta" Hollywood satire, with Kudrow playing an aging sitcom queen trying to hang on to her relevance. HBO tried it in 2005 and revived the show in 2014, but most critics found it more cringe-inducing than funny. Perry in yet another sports comedy. Here he was a sportscaster who attends grief counseling following the death of his wife. Perhaps a bit too dark for a network comedy, "Go On" struggled to find the right tone and aired for just one season on NBC in 2012. Showtime got four seasons out of this one, with Kudrow playing a therapist dispensing treatment in webcam sessions. "Generally inert," opined one critic. How you doin'? Not so good in this 2004 sitcom that tried to spin off LeBlanc's character into his own vehicle. Two seasons and it was done. Fumble! This comedy with Perry as a beleaguered sports-arena manager aired just nine episodes in 2011 before ABC benched it for good. 10. David Schwimmer/"Feed the Beast"
Give Schwimmer points for being different. The guy who played smart, socially clumsy Ross is back as a budding restaurateur in this AMC drama, but be warned, critics have not been kind: "A mess," one wrote. Well, she's not on the TV list, because after "Friends," the woman who played Rachel has focused on her film career, with starring roles in "Mother's Day," "Cake," and "Horrible Bosses," to name a few.